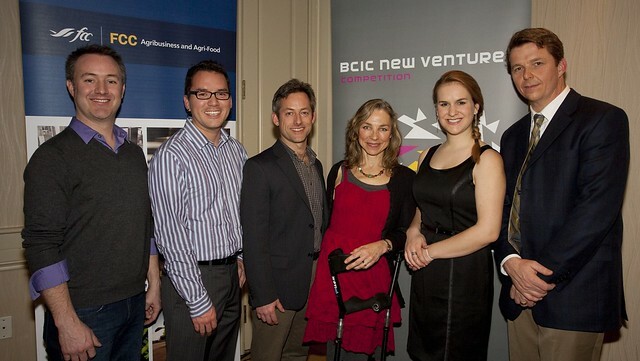 More than 100 members of BC’s technology community gathered in Kelowna on Thursday, February 23, 2011 at an invite-only event to celebrate the three early-stage technology companies taking top honours at the inaugural BCIC-New Ventures Competition: Regional Awards Ceremony. The broad spectrum of innovative technologies from the 17 finalists included a mobile monitoring system for people working alone, an online service that provides environmental product info and a portable biosensor to detect bacteria in drinking water. Recent university graduates and siblings, Ashley and Robert Roulston at Reef Safe Fish have developed a closed loop waste-recycling technology that filters fish waste and then combines it with fertilizer to produce fish food onsite. As an athlete and amputee, Sarah Doherty and her team at SideStix have revolutionized the common walking crutch for the disabled, developing an ergonomic, shock-absorbing forearm crutch that significantly reduces joint compression and the secondary injuries that often arise from using crutches. MemoryLeaf’s online memorial service, created by Jonathan Bowers whose family runs a local funeral home, lets users create a lasting legacy for their loved ones through photos, videos and stories. The service, arranged through local funeral service providers, also offers professionally developed resources to help answer questions about the grieving process. BCIC-NVC: Regional is a five-month competition – a boot camp for business startups – addressing the special interests of BC’s early-stage technology companies and supports BC’s emerging technology industry. The competition was open to any BC person, resident or business located outside of Metro Vancouver with a technology-focused idea that has not yet secured significant financing from external investors.